The weather warning was issued on Wednesday morning. The Met Office has issued a yellow status weather warning for ice. The warning, which was issued on Wednesday morning, applies to all of Northern Ireland and is valid from 4:00pm on Wednesday through to 11:00am on Thursday. 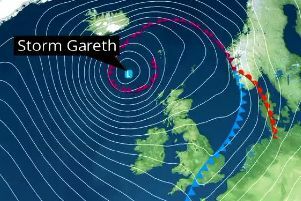 "Ice will again form on some surfaces from late Wednesday afternoon, which will continue through the night and well into Thursday morning," reads the warning on the Met Office website. "There will probably be icy stretches on untreated roads, pavements and cycle paths with some slippery surfaces likely. "There is also a small chance of travel disruption across parts of Scotland and Northern Ireland."